Increasing costs and shrinking margins have continued to pressure business managers and senior hospital leadership to rethink strategies for raising surgeons’ awareness of product and nonlabor costs within the OR. Often providers are asked to cut costs but are unaware of the actual costs of the products they use. In addition, they often do not know the cost profiles of their colleagues compared to their own. 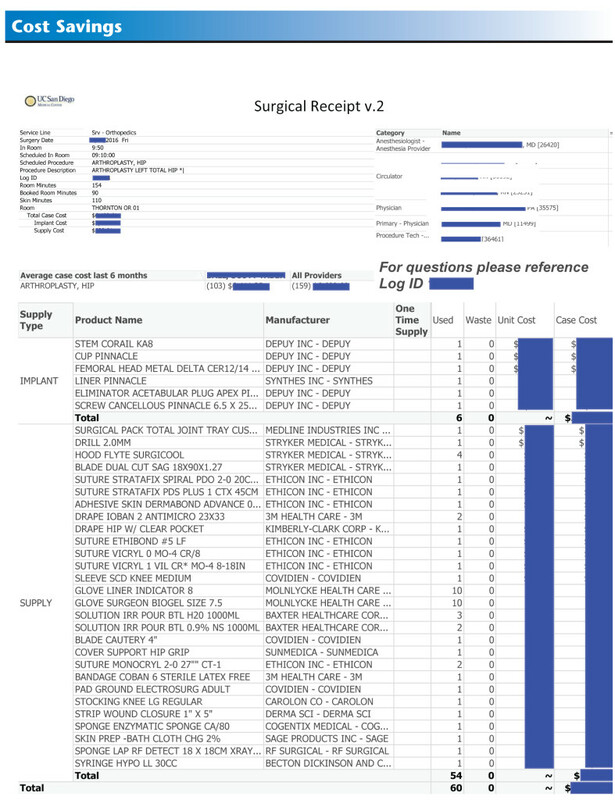 In the fall of 2015, the perioperative services business office at the University of California at San Diego (UCSD) partnered with the perioperative and imaging services informatics team to create a “surgical receipt” that would show costs generated by individual surgeons. Not only has the surgical receipt provided actual product cost and usage/wastage data, it has also increased quality assurance, improved communication and awareness of product use, and led to the creation of internal cost benchmarks. This article describes the process through which these results were achieved and lessons learned that may benefit other OR leaders grappling with this issue. The primary barrier to standardizing clinical work is individual bias in terms of safety and time. Often a surgeon may be wedded to a specific technique that was taught by a mentor, or may have had a singular experience with an instrument that has shaped his or her decisions. It is not uncommon at our institution’s product standards meeting for the surgeon to give a vague explanation of why a particular product is needed. Thus, the perioperative leadership designed a strategy to inform and support surgeons with data that would be personal to them. Historically, surgeons have been given aggregate batches of quarterly or yearly cost reports for the overall department that aren’t actionable. The centerpiece of the new strategy is the surgical receipt. UCSD recently went live with a new OR information system (ORIS). The surgical receipt was created to answer the executive committee’s request to get more data that could shed light on costs. The new ORIS integrates product costs from UCSD’s materials management information system, so the actual product cost of a given surgical case can be calculated. The business operations team began by providing small doses of information, in the form of dashboards, to the perioperative executive committee. At the point where there was a robust monthly dashboard, the next step was to initiate the surgical receipt for surgeons after they performed their cases. This receipt provides a way to help surgeons validate their costs on a case-by-case basis, which creates trust in the data. The receipts are e-mailed as a PDF to surgeons 3 business days after each case is performed. The strategy focuses on timely and actionable data first, with an intention to create aggregate cost-per-case data by procedure as a way to establish internal benchmarks. There are three teams that collaboratively support the perioperative services clinical team: materials management, business operations, and informatics. Informatics worked with the business operations team to build the technical specifications of how the surgical receipt looks and how it is generated and delivered. The materials management team, in conjunction with the business operations team, validated the cost and product data contained within the receipt. Within the ORIS, the nurse circulator for the case is responsible for documenting the products used or wasted on a case. During the case, the circulator modifies the quantity used or wasted for a given product based on the preference card. If the product is not on the preference card, the circulator can search for and add products to ensure appropriate charge capture. In developing the surgical receipt, the informatics team incorporated certain data dimensions and calculations related to the case. Dimensions, syntax, and an example of each are shown in the sidebar on page 22. Once all the relevant data were extracted and validated, the decision was made to send the PDF receipt 3 business days after surgery. This was needed to give the business office charge capture team enough time to attach relevant invoices and review charges on a case before delivering a surgical receipt. On the third day, the new program retrieved every case a particular surgeon completed, collected all the data points, and performed the calculations listed above. The data were turned into a PDF receipt for each unique surgical case. The PDF was e-mailed to the surgeon from the business operations office e-mail address, thus allowing surgeons to reply with any questions or concerns. A typical surgeon question often results in a call by the business office to the circulating nurse, the materials management team, or the clinical coordinator for clarification, which allows the business office to close the loop with the surgeon. This closed-loop workflow has helped immensely with reinforcing surgeons’ trust in their cost-per-case data. In addition, this workflow has opened the conversation among surgeons, nurse circulators, clinical coordinators, materials management, and the business office. The surgical receipt has led to four distinct and favorable outcomes. We have successfully provided surgeons with cost transparency about actual product cost and usage/wastage. An example of this transparency benefit was that surgeons noticed a more expensive suture being used and quickly asked to have their preference cards changed to list a lower cost suture. We have a quality assurance step showing surgeons what the nurse circulators document on their cases—a step that they did not have easy access to previously. With manual data entry, it is not uncommon to make mistakes, especially in an active OR. Having another level of review and validation of what was charted helps improve the accuracy of documentation. Surgeons are taking note of products documented that they do not recall using. We believe this occurs because nurses often open products prematurely in anticipation that the surgeon will need them. The surgical receipt documents these wasted products and factors them into the overall case cost. Now surgeons are talking with nursing staff to minimize product waste, which decreases the cost of the case, minimizes hospital waste, and adds to surgical team cohesion. We have the ability track and report on the true cost per case in the OR, which we are using to establish internal cost benchmarks. Once our procedure and workflow were established, we did a preliminary study on the effect of the surgical receipt on supply costs. We began by choosing a group of high-volume, high-cost procedures performed by more than one provider. We measured the average cost per case for the 4 months before and the 4 months after implementation of the surgical receipt (pre-receipt: June to September 2015; post-receipt: November 2015 to February 2016). To summarize the financial impact data, we observed a decrease in average cost per case on 18 of 34 procedures (53%). On average, we drove down the cost per case by $49, including cases where cost per case rose rather than decreased. The 4-month span post-receipt covered 1,268 cases, and therefore netted a savings of $63,363. The largest of our three surgery locations has a medical supplies budget of $2.2 million per month, so the savings observed is modest at best. Over the past few years, however, the cost per case of all procedures has been on the rise, and our medical supply budget has consistently grown by 7% to 10% per year every year, so these are encouraging results. The data set has yet to go through the scrutiny of statistical analysis to evaluate the statistical significance of our outcomes. We plan to study that in the future through analysis of a larger data set. There were unanticipated benefits to the surgical receipt, as noted by our surgeons. One provider commented that because we are providing booked room minutes and actual room minutes, surgeons are becoming more familiar with how accurately they are scheduling case durations. For example, if a surgeon books a case for 120 minutes, but the case actually takes 200 minutes, direct feedback on that variance is provided on the surgical receipt. We have heard anecdotal feedback on this effect; however, the data do not yet reflect an improvement in this area. Presurgical receipt case booking accuracy was measured at 56% (providing a 30-minute tolerance), and postsurgical receipt case booking accuracy was measured at 56% (providing a 30-minute tolerance). One analyst noted that in February 2016, the last month we measured, booking accuracy was at 58%, the best month we’ve recorded this fiscal year. We plan to continue to measure this for our next study. Another benefit was improved first case on-time starts, in part from surgeons receiving direct feedback on the time a case is scheduled and their in-room time. Presurgical and postsurgical receipt first case on-time starts were reported at 71% and 76%, respectively. Improving on-time starts has been a focus of the surgery team this fiscal year, so it isn’t fair to attribute this improvement solely to the surgical receipt, but we believe the timely information is a contributing factor. An internal audit of the ORIS took a close look at our project, and it stood up to the scrutiny of the auditors. They commented favorably on the effectiveness of this program for quality assurance and transparency. Ancillary benefits as noted above are important to the overall operation of our OR, and we are finding value in tracking metrics such as these and will continue to do so as our surgical receipt evolves. The objective benefits of cost-per-case reductions, improved quality assurance, and operational improvements—as well as subjective benefits such as transparency of information and reinvigorated communication among surgeons, nurses, and the business office—have collectively had a strong influence on the culture of our surgery program. We believe this surgical receipt has proved a strong foundation to build upon, and for our next version of the receipt, we will be adding a few data points and calculations to make the receipt more effective. We have had requests to add a flag for whether the case was considered late or on time, by calculating the difference between the scheduled start time and the in-room time. Surgeons have also asked that we provide the scheduled amount of “skin minutes,” defined as the incision to close time that our ORIS allows us to track. A surgeon’s focus is typically on skin minutes, and the business team and hospital are typically focused on the room minutes, so both are quite useful. We will also be adding to the receipt the names of all of the staff who finalize the charge capture documentation, the RN circulator names, and the clinical coordinators assigned to the service, in an effort to speed up communication from the surgeon to entire team that supports the surgery. Lastly, we will be adding two calculations: average cost per case for the selected provider and selected procedure for the last 6 months, and average cost per case for all other providers for the selected procedure for the last 6 months. The two calculations will allow surgeons to see how they compare to their colleagues using an internal benchmark. In developing the surgical receipt, the informatics team incorporated certain data dimensions and calculations related to the case, as shown in this example. Source: University of California at San Diego. Used with permission. One of the challenges that administrators face is creating an ongoing dialogue between perioperative management and the surgeons regarding costs in the OR. In our case, surgeons were asking for data, but were not articulating exactly what they wanted. The biggest benefit resulting from this project is the increased communication between the surgeons, nurses, and administration. Surgeons are giving clinical teams feedback on what to open and when. In the past, the clinical staff would often open items ahead of time in an effort to save time. Now the surgeon and staff are focused on striking a balance between efficiency and cost. Providing feedback on each individual case average and those of departmental colleagues has improved the product review process. In a future version there will be comparison to industry benchmarks to further fine-tune supply usage and procedure metrics. Blake J. Stock, MBA, BS, is business manager of the perioperative and imaging services departments at the University of California San Diego. 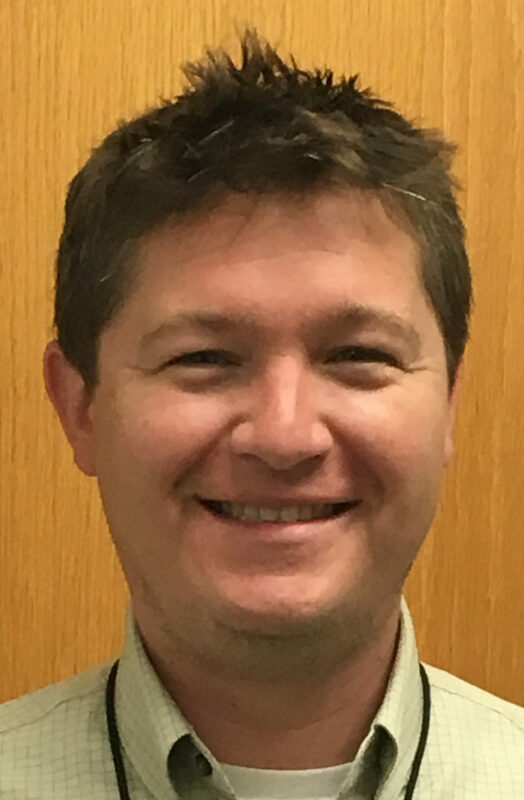 His experience includes healthcare information systems, project management, financial analysis, advanced analytics, and real-time location systems. He will be a presenter at the 2017 OR Business Management Conference, which will take place in New Orleans January 30 – February 2. Thomas Hamelin, DNP, MSN, MBA, BSN, BS, RN, is senior director for perioperative services, radiology, and SAMNIS at the University of California San Diego. He is also the administrator for UCSD’s Level 1 trauma and verified burn programs. 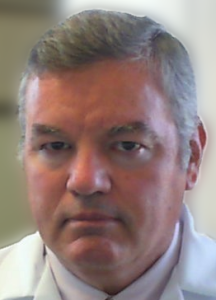 He has been managing complex departments for 30 years and has worked for multiple medical centers and large corporations. Avansino J R, Goldin A B, Risley R, et al. Standardization of operative equipment reduces cost. J Pediatr Surg. 2013;48,1843-1849. http://dx.doi.org/doi:10.1016/j.jpedsurg.2012.11.045. Gitelis M, Vigneswaran Y, Ujiki M, et al. Educating surgeons on intraoperative disposable supply costs during laparoscopic cholecystectomy: A regional health system’s experience. Am J Surg. 2015; 209, 1107-1112. http://dx.doi.org/doi:10.1016/j.amjsurg.2014.09.023. Vigneswaran Y, Linn J G, Gitelis M, et al. Educating surgeons may allow for reduced intraoperative costs for inguinal herniorrhaphy. J Am Coll Surg. 2015; 220, 1107-1112. http://dx.doi.org/doi:10.1016/j.jamcollsurg.2015.02.030.